Now that we’ve seen our program in action, let’s take a closer look at it and tweak it a little. The dark gray boxes on the patch are called nodes. A node is a visual representation of some physical device or some function: from math and logic to more complicated stuff like producing, filtering or accumulating values, measuring time, etc. Our program consists of clock, count, and watch nodes. 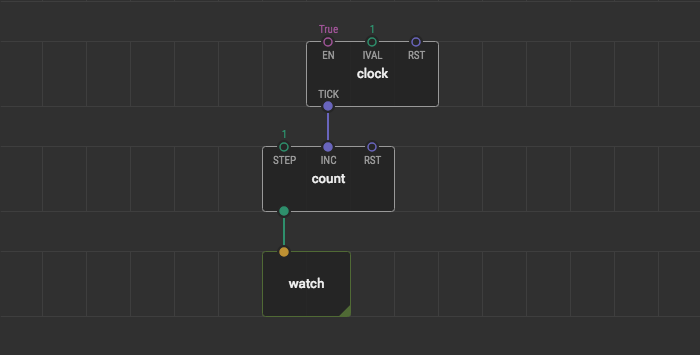 clock ticks at a given interval, count increments its value with each incoming tick, and watch displays the value during debug or simulation sessions. The small colored circles on the nodes are called pins. They are used to transfer data between nodes. Pins are divided into inputs and outputs. Inputs are always on the top side of the nodes, outputs are on the bottom. Nodes process the values from input pins and take some action or give a result. The values come to input pins from other nodes outputs through links during program execution or are constantly bound to pins using Inspector during program creation. Let’s learn how to bind values to input pins with the Inspector pane. Click on the clock node. You will see the Inspector pane under Project Browser. In the Inspector, change the IVAL value from 1 to 0.1. Run the simulation. Notice that the counter value increments much faster. Try to bind another value to counter’s STEP and see how it affects the behavior.